video and multimedia to engage and immerse attendees. Worship service at the Miami Vineyard Community Church. Image courtesy of Eiki International. 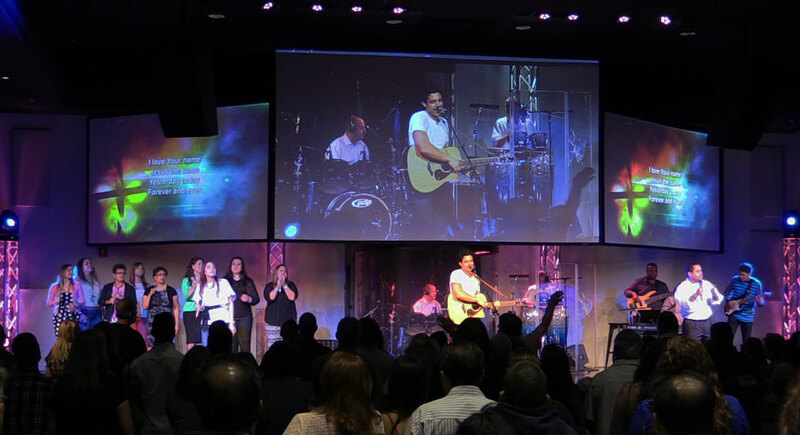 Florida's Miami Vineyard Community Church is neighborhood-focused and offers its congregation a wide range of programs. To help keep its services vibrant in a new sanctuary, the church reports relying on three large video screens that receive their images from three EIP-HDT30 HD widescreen projectors drawn from the catalog of Santa Margarita, Calif.-based Eiki International Inc.
Cape Coral, Fla.-based Creative Sound and Lighting Solutions LLC, an AV design/build firm that handles audio, video, lighting, and acoustics for the commercial and church markets, were contracted to design and implement Miami Vineyard Community Church’s new video display system. Rob Robinson, general manager and co-owner of Creative Sound and Lighting Solutions, managed the project. He discussed the installation and his reasons for deploying the Eiki projectors. "The church’s senior management wanted a system that offered the flexibility to show all of the content with sharp, detailed images and color that really grabs you." To address the requirements of the project, Robinson and the Creative Sound and Lighting Solutions crew deployed three large screens at the rear of the stage area into a convex shape with the curvature facing out toward the audience. This approach enables members of the congregation to see the displays clearly from all areas of the sanctuary. All three Eiki EIP-HDT30 projectors are positioned approximately 20 feet out from the front of the stage using standard 1.5-inch pipe, which protrudes down about two feet from the ceiling. Robinson offered these closing thoughts: “Since day one, the Eiki projectors at Miami Vineyard Community Church have been nothing short of terrific. Picture quality is first-class and they’ve been absolutely bulletproof. With the EIP-HDT30 projectors, the church now has the image magnification (IMAG) they always wanted and they have been extremely complimentary about their performance. With the addition of these three projectors, Miami Vineyard now has a total of seven Eiki projectors on the premises." Re-printed courtesy of Church Designer, Production Media, Inc.
Read the article at the Church Designertm website. Get more EIP-HDT30 information here.